When you start planning your Uyuni trip you can use this as a checklist of things you need to know about the town of Uyuni and the salt flats (Salar de Uyuni) to ensure you have the most awesome trip! What to take, how to get there and other tourist info. 1. Don't underestimate the distance. The Salar de Uyuni is the largest salt desert on Earth. It covers 3800 square miles (the size of New Jersey). See the Uyuni home page to read all the unbelievable facts about the Uyuni salt desert. Most tours last 3-5 days. 2. 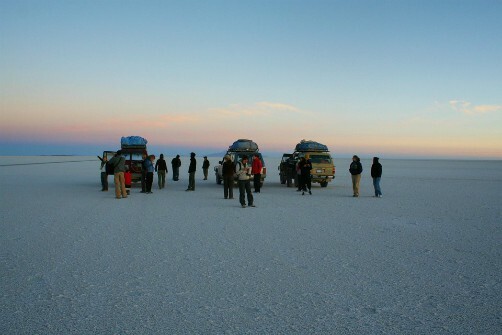 Use a well-trusted tour operator and take a planned Salar de Uyuni tour. This is Bolivia's most popular tourist attraction. Everyone wants to be an Uyuni tour operator. But not everyone does it well. Not all use experienced drivers or guides. It's why I recommend travel insurance and this tour operator. 3. Be sure you can withstand high altitudes. Located over 12,000 feet above sea level in a very remote region, the Salar de Uyuni is not for people with heart conditions. There will be long drives to get there and the weather is cold too. Read about altitude sickness here and what you can do to get relief. 4. Reserve a hotel or hostel well in advance. If you decide to go on your own, book a hotel or hostel online through a trusted site before you arrive. This town of only 14,000 has quite a few hotels and hostels but not all are very good and they get filled up during much of the year. 1. Sunglasses. The vast Uyuni salt flats act as a mirror reflecting the sun. 2. Sun block. The stark whiteness of the salt beds don't absorb light like colors do. 4. Bottled water. You can purchase beverages when you arrive, but it's a looong drive. 5. Warm clothing. This is a desert but it's 3650 meters above sea level. Nights are cold and it's very windy. Dress in layers so you don't sweat or freeze. Uyuni weather forecast. 7. Swimsuit. If you plan to visit the hotsprings you'll need one. 8. Rain boots. If you travel during the rainy season, you'll need these to explore the salar. 9. Fuel and oil. If you choose to rent a car you should take extra fuel and lubricants. However, you can also purchase them in the towns of Alota, Quetena Grande, and Quetena Chico. 10. A well-maintained vehicle. You can only find very basic mechanic shops in Alota and Quetena so be sure your vehicle is in top shape! 11. Tools. shovel, pick axe, spare tire, and during the winter you may even need anti-freeze for your car. 12. Lots of cash. Unless you're staying at one of the more expensive hotels, Uyuni has no automatic tellers if you run short of cash. It does have banks. 13. Proper cellphone. If you plan to bring your international cellphone, you should know Bolivia uses a different system than many countries. Read more about that below. 14. Cameras, batteries, battery chargers, cellphone charger, electric current converter and if you use a digital camera, extra memory cards. The electricity in Uyuni is 220. I recommend a solar charger as your room may have only one outlet. 15. Tissue or wipes. There are restrooms at the site, but these rarely have toilet paper. In the town, the situation is similar at small eateries and if you are adventurous enough to use a public restroom, you may be asked to pay for toilet paper or an entrance fee to the bathroom (usually Bs. 1). 16. Zip lock or plastic bag. Please carry in and carry out. Any trash you have should be disposed of properly and not on the site. This includes chewing gum and cigarette butts, although you shouldn't smoke at the site. 17. Pills for altitude sickness. If the high altitude makes you feel lightheaded or queasy, it's good to have some Sorojchi Pills with you. These are pills for high altitude sickness that can be purchased at almost any pharmacy for about Bs.1 each, no prescription needed. They contain: Acetylsalicylic acid 325 mg, Salophene 160 mg, and Caffeine 15 mg. They prevent headaches, dizziness, fatigue, nausea and drowsiness. 18. Medicine for stomach upset. You may also want to consider carrying with you something to alleviate mild stomach upset in case you eat something that doesn't sit well with you. Consider purchasing a few envelopes of Alka Seltzer or a Bolivian version such as Digestan Compuesto, the ingredients of which are listed here. The impressive and diverse geography of this region and the Eduardo Avaroa national reserve offer attractions throughout the year. However, you should take seasonal variations into account. Between November and March (summer in Bolivia) the weather is slightly warmer but it's also the rainy season. 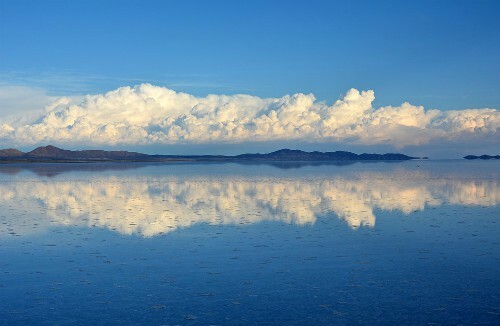 When it rains the water accumulates on the flat surface of the Salar de Uyuni and reflects like a mirror. The water may be just a few millimeters deep, or up to 20 centimeters deep. Tours may be delayed as vehicles suffer rust damage from the salty water. When the Salar is covered in rainwater, most tour operators recommend not going to the Isla del Pescado for your safety. The rainy season, however, is also when thousands of flamingos migrate to the region to mate. You'll find them around the Laguna Colorada and Laguna Verde. The best month to see this is usually December. In the winter, especially in June and July, temperatures can drop to well below freezing. The air is very dry and it doesn't rain. Bring lots of winter clothing during this time. Click here to see the weather in Uyuni today and for the next 15 days. Click here to see more about the climate in Bolivia. 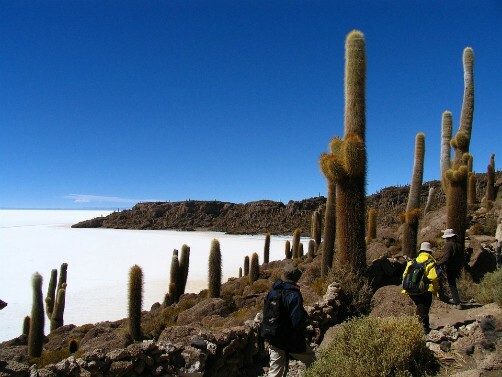 Click here for tourist attractions in Uyuni you can visit during the year. 1. Electricity in Uyuni, Bolivia is 220 V. Electricity in surrounding communities is provided by generator and is available from 6 am to 10 pm. This also means there may be no hot water during "off" hours. 2. There are several banks in Uyuni but they won't be open during the siesta hour (roughly 12:00-2:30) and will be closed on weekends. Banks and some "casas de cambio" (exchange houses) change dollars, euros, pesos chilenos, and soles, etc. There is also a Western Union in Uyuni. 3. Few establishments accept credit cards. None that I know of accept travelers checks. Hotels may be able to exchange dollars or Euros but little stores, small hotels and most restaurants won't. Bolivian money. 4. There is national and international phone and fax service at local ENTEL "call centers" or kiosks where you can also place cellphone calls. There are also a few internet cafés. Most hostels don't have internet or WIFI. Most larger hotels do. If you plan to bring a cellphone with you, be aware that Bolivia is on a different grid and many overseas cellphones don't work here. Here's how to place phone calls in Bolivia. 5. Most tour prices don't include extra things like entrance fees to the Salar, Eduardo Avaroa reserve, and other attractions you may want to see like museums. 6. Be careful of "police officers" who ask to see your passport or documents. Still, by law you must carry your documentation at all times. 7. Many tour operators don't have English-speaking guides. If they do offer a translator, the translator costs extra. 8. There is a tiny tourist information office at Avenida Potosí No. 9 and the phone is 591-2-693-2102. In town just dial 693-2102. No one speaks English there though. 9. Never accept a foreign bill, such as dollars, that have even the tiniest tear. No one will accept them from you. 10. The post office (ECOBOL) is located on Cabrera street near the corner of Arce Avenue in the bus station. You can send national and international mail. Phone: 693-2045. 11. There are 7 local TV stations and at hotels that offer Cable TV you get about 40 more. 12. If you need medical care, there are three hospitals in Uyuni called José Eduardo Pérez Hospital (phone: 693-3203), Hospital Ferroviario (phone: 693-2182) and Hospital Obrero (phone: 693-2025) and there are several pharmacies in town too. However, between other cities and Uyuni there are few or no medical facilities. 13. There are a few laundry services. If your hotel or hostel itself doesn't offer this service, they can tell you who does laundry by the kilogram in town. 14. In Uyuni the Immigration Office (Migración) is located at Avenida Potosí No. 35 on the corner of Sucre Street. 15. You can also contact the UNIDAD REGIONAL DE TURISMO located inside the Mayor's Office (Alcaldía) on Potosí Street if you need any help. Weekdays only. 16. The Police Station is on Avenida Ferroviaria between Arce and Bolivar. 17. I seriously recommend travel insurance if you're planning to take an Uyuni trip. I never used to but now here's why. You can take an inter-departmental bus line from Potosí, Oruro or La Paz. Although there is a train station. See train info below. Uyuni also has a tiny non-commercial airport, but it is not used for tours. The Terminal de Buses in Uyuni is located at Calle Arce and Cabrera. You can take a bus from La Paz at the Terminal de Buses located at Calle Uruguay - Plaza Antofagasta (591-2) 228-0551. You need to take a bus to Oruro first, then change buses and take one from Oruro to Uyuni, although there are 2 buslines that sometimes don't require a change in Oruro (although they stop there) (Todo Tourist and Panamericana Sur) but be sure to ask about these. La Paz is 229 kilometers from Oruro and the road is paved the whole way. About 3.5 hours drive from La Paz to Oruro. The bus station in Oruro is located at Calle Vacovic and Villarroel (591-2) 527-9535. From Oruro to Uyuni it's an all-night drive. You can take a bus from Potosi at the Terminal de Buses located on Av. Universitaria (591-2) 624-3361. There are several morning and evening departures daily. It's about 6-7 hours to Uyuni from Potosí. WHAT'S BETTER? Public buses in Bolivia are not for everybody. Don't expect much comfort. Often buses are completely full and people even sit in the isles with their luggage. Such is not the case with the tourist bus between La Paz and Uyuni. Click here to book your trip through Ruta Verde and take the tourist night bus. They'll be sure you get English speaking assistance, a hot meal and extra oxygen in case the altitude makes you feel ill. They'll also help you get to Uyuni from Sucre, Potosí, Santa Cruz and San Pedro de Atacama. Basically, they're our recommended option because they are super informed and they speak English, Spanish and Dutch! You can take the Ferroviaria Andina S.A. from Oruro to Uyuni (it then continues on to Atocha, Tupiza and Villazón). The train leaves Oruro at about 3:30 pm and arrives in Uyuni at about 10:20 pm. Every Tuesday and Friday leaves Oruro at 15:30, arriving in Uyuni at 22:20. Every Sunday and Wednesday the train leaves Oruro at 19:00, arriving in Uyuni at 02:20. Trains from Uyuni to Oruro leave on Wednesday and Saturday night at 00:05 (so officially it's Thursday and Sunday already) arriving in Oruro at 07:00 and on Monday and Thursday night at 01:45 (so officially it's Tuesday and Friday already), arriving in Oruro at 09:10. SOUND CONFUSING? Book your trip through Ruta Verde (to whom we are grateful for sharing this information) and they'll get you there safe and sound. They also have a complete train time table on their website.